Signature is considered to be a behavioral biometric based on behavioral characteristics of the person, more so the physical properties, such as fingerprint or face. 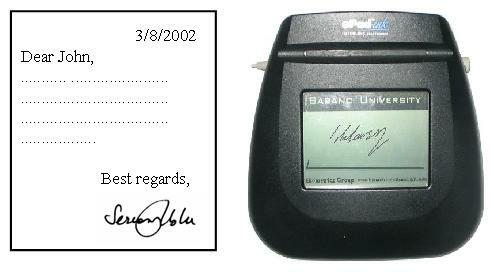 Signature verification is split into two areas according to the available data in the input. Off-line signature verification takes as input the image of a signature and is useful in automatic verification of signatures found on bank checks and documents. On-line signatureverification uses signatures that are captured by pressure-sensitive tablets and could be used in real time applications like credit card transactions or resource accesses. The online signature verification system developed by Prof. Berrin Yanikoglu & Alisher Kholmatov has won the first place at The First International Signature Verification Competition (SVC 2004) organized in conjunction with the First International Conference on Biometric Authentication (ICBA 2004). The recognition rates were 2.8% equal error rate for skilled forgery tests. (a previous form of the above paper). "An improved decision criterion for genuine/forgery classification in on-line signature verification", Alisher Kholmatov and Berrin Yanikoglu, ICANN/ICONIP June, 2003.